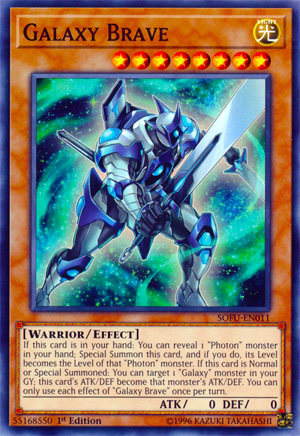 If this card is in your hand: You can reveal 1 “Photon” monster in your hand; Special Summon this card, and if you do, its Level becomes the Level of that “Photon” monster. If this card is Normal or Special Summoned: You can target 1 “Galaxy” monster in your GY; this card’s ATK/DEF become that monster’s ATK/DEF. You can only use each effect of “Galaxy Brave” once per turn. Galaxy Brave is the next “Galaxy” card we’ll be reviewing this week. Synergy within the archetype with its Level 8 and LIGHT Attribute, lending to the Honest, Galaxy-centric, and Trade-In support. Worth noting Shining Angel can Special Summon this from the deck. Reveal another Photon monster and Special Summon this monster, another easy way to Special Summon this monster. Level changes to whichever Photon you revealed, meaning you have a variety of Xyz and Synchro options to choose from, or keep it Level 8 with another Level 8 Photon. Once summoned it’ll target a Galaxy monster in the grave and its ATK/DEF will copy that monsters stats. This can make it a huge monster with only the use of a Trade-In on a Galaxy Soldier, or off a Link/Xyz summon. The Galaxy/Photon archetype has always had an ability to spam the field with strong monsters and control-based monsters, and this card continues that legacy. What if Galaxy Soldier grew up a bit? Galaxy Brave is a Level 8 Light Warrior-type monster with 0 Atk and 0 Def. We can forgive the Atk and Def because of the other stats having Light, Trade-In, and Galaxy support. Also, the second effect is to increase those stats anyway upon Normal or Special Summon. Just target a Galaxy Monster in the grave to change the Atk and Def to that monster’s Atk and Def. I thought it was funny that you could target another Galaxy Brave and have 0 Atk and 0 Def. Better options would be one of the Galaxy XYZ monsters with 4000 Atk. Pretty much anything that is actually run in the deck with Galaxy in the name has 2000 or more Atk. Going back to the first effect, you can reveal a Photon monster from the hand to Special Summon Galaxy Brave from the Hand. You could then use the second effect or just XYZ summon something. Both effects are once per turn, but the synergy between the two of the effects makes Galaxy Brave a one card support or beat stick free Special Summon. Not necessarily great in the opening hand for the second effect, but everything else makes running this well worth it. Try 2. Score: 4/5 Art: 4/5 Big sword. The Galaxy Archetype is known for Level and Rank 8s, so it is fitting they got a new Level 8 monster here. Galaxy Brave is a Level 8 LIGHT Warrior with 0 ATK and DEF. Stats are poor for a Level 8, but LIGHT and Warrior are great. If this card is in your hand, you can reveal 1 Photon monster in your hand to Special Summon this card and if you do, its Level becomes the same as the Photon monster revealed. So this basically will either be a Level 4 or 8, depending on what you reveal. Nice way to extend yourself into a Rank 4 or 8 play overall, or by just getting a body for a Link Monster. The only problem is that it has to be a Photon monster and not a Galaxy monster as well, but that isn’t too bad considering you got a plethora of Level 4 Galaxy monsters you are playing and you can easily get to the Level 8 Galaxy-Eyes Photon Dragon. If this card is Normal or Special Summoned, you can target 1 Galaxy monster in your GY and this card’s ATK and DEF become the ATK and DEF of that monster. So that is where the stats come from at least. Targeting Galaxy Knight will make this 2800/2600 and Galaxy-Eyes Photon Dragon will make this 3000/2500. Not too shabby. Both effects are hard once per turns because of course they are. This is worth playing in Galaxy/Photons maybe as a two of so you are less likely to draw multiples. Art: 4.25/5 He looks very brave to me. Galaxy Brave, the Knight who could! This is a Level 8, Warrior, Light attributed, with 0 attack and defense. Right away, we should assume or hope there’s an effect(s) to make up for this, and fortunately, there is/are. First off, we see that we can Special Summon Brave from our Hand by revealing a Photon Monster, also from our Hand, and the Level of G.B. becomes the Level of the Monster you revealed. Special Summon are good, and the ability to manipulate your Level is also a good thing, depending on whatever your next play/Special Summon (XYZ?) in this case perhaps, is going to be. If Normal or Special Summoned (we like versatility in our effects, don’t we) you can Target a Galaxy Monster in your Graveyard and steal its attack and defense. Stop me if you’ve heard this before, but both effects here are once per turn, not that we should be surprised by that. I like Brave, this is quietly a card that should be a good asset for you, easy to bring out, and can be very strong based on what you have in your Graveyard. I’m not sure if I’d play more than one, but it’s still a welcome addition to the Deck. Art: 4/5 Like all the cosmic swirls, prefer the dark and the green here to yesterday, and the Knight and armor look is fun too.